Gardeners with clay soil have a heavy soil for growing plants. Clay soil contains at least half clay particles, making it exceedingly slow draining and dense enough to make root growth difficult for plants. To determine whether you have clay soil, hold some in your hand and squeeze it tightly. If the soil compacts into a tight ball when you squeeze it, you likely have clay soil in your hand. If clay soil is also highly acidic, it will be even more difficult to cultivate for growing. Lower the acidity and raise the pH levels by adding lime to clay soil. Sprinkle 1 2/3 lb. of agricultural lime over every square yard of growing area in the autumn of the year after you finish growing plants in the area. Sprinkle the lime evenly over the entire area to cover it. Work the lime into the soil with the garden spade or the rototiller to incorporate it into the soil evenly. Strive to work the soil to a depth of at least 4 inches. Rake the soil smooth after you finish incorporating the lime. By adding the lime in the autumn at the end of the growing season, the lime can work to amend the soil during the winter months. Agricultural lime can damage plants, so keep the lime away from existing plants. 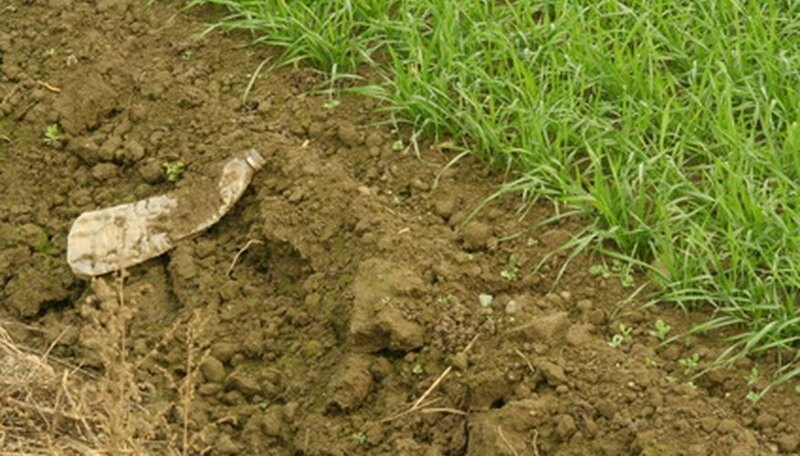 Clay soils respond slowly to lime amendments due to the heavy nature of the soil. Do not apply lime and fertilizer to the soil at the same time because the two chemicals will work against each other in the soil and negate the benefits of each.